[Jerome Kelty] just finished building this awesome data-logging Sonic Screwdriver with his 6-year-old son [Sam]. The Halloween previous, [Jerome’s] older son had dressed up as the Doctor, which had inspired [Sam] to make his own Sonic Screwdriver — however he declared that his screwdriver needed to actually work! They sat down together and decided what it needed to be able to do. [Sam] has a pair of hermit crabs, so they thought it would be handy to be able to measure the temperature and the humidity of their habitat. It needed a flashlight for obvious 6-year old reasons, and it had to make the right sound effect when you used it too! So out came the sketchpad and they started designing it to be cut on the lathe, using a combination of aluminum, brass and wood. Many weekends later [Sam] and his dad finished the body of the screwdriver and started work on the electronics. To keep it simple they used an Arduino Pro Mini 5V with a Sparkfun OpenLog to record all the data — and a handful of sensors of course! After modifying the body a few times they finally got all the electronic guts to fit inside the screw driver. It features an SD card you can remove to see the OpenLog data, but as a “cool factor” [Jerome] also programmed in the temperature sensor to output to the RGB LED, so little [Sam] can point at things to determine how warm or cold they are. Any Doctor Who fans out there? 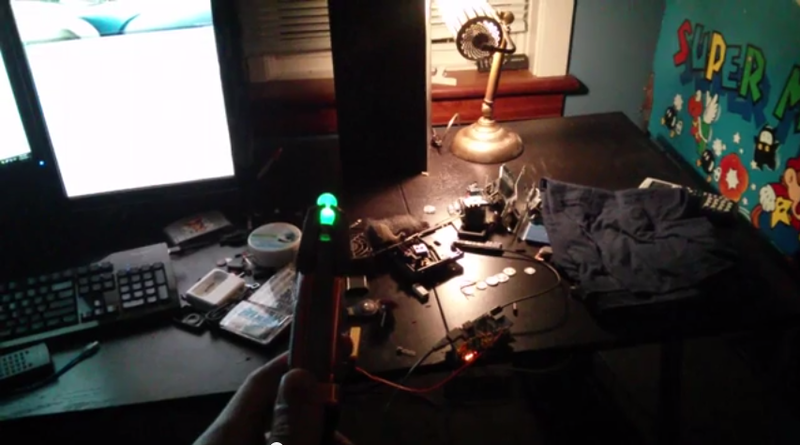 [Pat] just sent us his project on home automation… using a Sonic Screwdriver! Ever since he pre-ordered his Raspberry Pi at the beginning of February 2012, he knew he wanted to try his hand at home automation. The easy way was to use X10 outlets, but at $20+ an outlet, it’s not that affordable. Instead, he managed to find a rather cheap system on Amazon — RF controlled outlets. They only cost about $35 for a 5-pack! It’s a very basic system: five outlets with five buttons on the remote. All he had to do was wire up the Raspberry Pi to simulate the button presses by setting the GPIO pins high, and presto, a simple but effective home automation setup. This is where it starts to get fun. Unfortunately, unlike a real Time Lord, [Pat] didn’t build his sonic from scratch. Instead, he found a universal remote control — styled after [Smith]’s sonic. Add another RF receiver to the Pi, a web-based interface to extend the range, and bam, you’ve got one geeky, but awesome, home automation setup. Stick around after the break to see it in action! [furrysalamander] has a friend that is a really big Doctor Who fan. It happens that this friend has a birthday coming up, and [furrysalamander] wanted to get her something amazing. A Sonic Screwdriver is always a great gift, but [furrysalamander] wanted to put his personal touch on it. He ended up adding a TV-B-Gone to ’s screwdriver, turning a fictional deus ex machina into a functional device. The body of the Sonic comes from this replica of ’s screwdriver from Think Geek. Inside, the screwdriver has space for a battery a circuit board to control the lights and sound normally expected of a sonic screwdriver. [furrysalamander] added a freeform circuit composed of an ATtiny85, a transistor, LED, and a few resistors to add the ability to turn just about any TV off. Of course [furrysalamander] needed to program the ATtiny with the TV-B-Gone firmware, and lacking any AVR development tools he used a Raspberry Pi’s GPIO pins to write the firmware to the microcontroller. That’s something we’ve seen before, but [furrysalamander] is a champ for including the process in his Instructable. The end result is a Sonic Screwdriver that doesn’t work on wood and can’t break a deadlock seal. It turns off TVs just fine, though, and looks great to boot. You can check out a demo of [furrysalamander]’s sonic in action after the break. 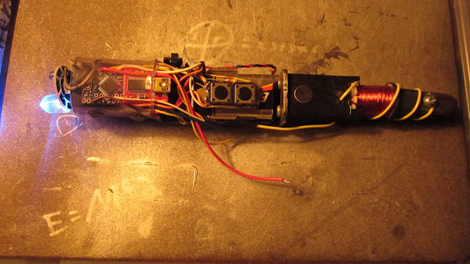 “I don’t understand, you don’t have the technology.” OK, so it’s not actually a futuristic tool with the same capabilities as the one off the hit TV series Dr. Who, but this homemade “sonic screwdriver” is a multifunction device that’s pretty cool nonetheless. Check out a video showing off some of the features after the break. Sure, you could pretend to be the Doctor with a simple plastic sonic screwdriver. It might even have a LED on the tip, and if you’re really splurging a tiny speaker for sound effects. Yep, you could make due with an inelegant version of the Doctor’s Gallifreyan army knife, or you could get this amazingly detailed sonic screwdriver replica. Instead of a plastic or resin replica, this replica of the 11th Doctor’s sonic screwdriver is made out of die-cast, copper plated metal with a jade green polycarbonate tip. This replica has a few tricks up its sleeve; instead of just lighting up and providing a few sound effects at opportune times, it also can serve as a programmable infrared remote with a gesture interface thanks to a three-axis accelerometer. If that’s not enough, the copper ‘rods’ just below the tip also serve as a touch interface for the microcontroller on board. For as many jaw dropping light saber builds we’ve seen we’re genuinely surprised we haven’t seen more sonic screwdriver builds. It’s really cool this toy can serve as a remote control, but we’re betting a few Hackaday readers can replicate this replica with an extendable jewel cage and maybe even a Bluetooth gesture controller. If you’d like your own sonic screwdriver, you can pick one up at ThinkGeek (for the US) or Forbidden Planet (for the UK). After the break is a video released by ThinkGeek showing off the this truly awesome remote control. Tip ‘o the hat to [Zerocool] for sending this one in.